Have you ever marveled at how fast technology advances? If you are of a certain age, you may remember marveling that your cell phone was actually capable of taking pictures, and even eight-second videos. If you are even older, you might remember that using a phone meant that you had to have a land line, or when a remote control for your television actually required a cord – and if you tripped over it and broke it, you had to get up again to change the channel. To be sure, technology advances by leaps and bounds, and this is true in the world of dentistry as much as it is anywhere else. 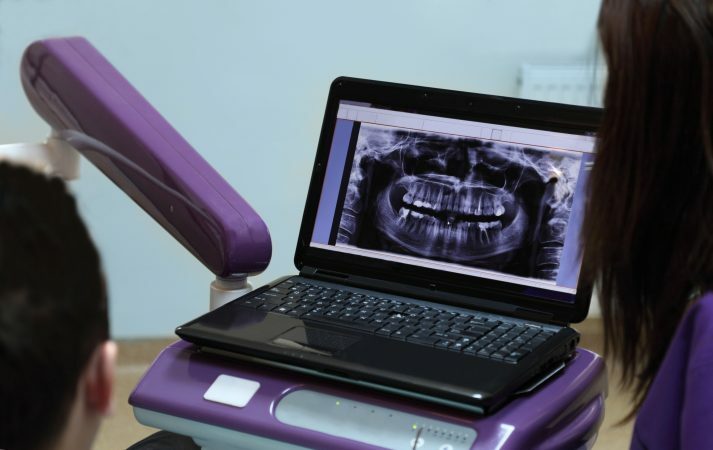 At Redford Dental Care, we strive to stay on top of the technology that is available for the benefit of our patients. The following are just a few of the means and methods we have of doing so. Do you remember when having images taken of your teeth and the underlying structure meant miserable x-rays involving huge metal plates shoved into your mouth? Or even further back, when identifying a cavity meant nothing more than a visual examination by your dentist? Today, most dental imaging is done by means of intraoral cameras. The procedure involves having a small camera inserted into your mouth. The camera takes 3D pictures, and transfers them to a computer, where special software allows your dentist to see your teeth and the underlying structure from all angles, magnified by about 25 times. Decay, wear, plaque, damaged fillings, and more show up in full detail, allowing your dentist to know exactly what is happening in your mouth, and to determine what action needs to be taken. Another benefit to intraoral cameras is that if your insurance company requires proof as to what needs to be done, they can receive it immediately via email attachment, and will usually have no cause to refuse coverage. Obviously, that did not make for a stellar quality of care. Today, your dentist can almost always get the image needed in a single shot. Even better, the plate used is smaller and far more comfortable in the patient’s mouth. You do not have to wait for films to be developed, because all the images are delivered digitally to a computer. You get better, more accurate treatment, with less time spent in the dentist chair. One of the most amazing advances in dental technology is the CEREC system. In years past, getting a crown or porcelain veneers used to take weeks – you had to sit in the dentist chair, bite into trays of disgusting goop, and then wait for your impressions to go to a lab where your restorations would be made, and wait weeks for them to come back. Now, you can have your restorations made in just one visit to your dentist. With CEREC, your dentist takes 3D images of your mouth, chooses a piece of dental porcelain that looks like your tooth, and sends it to the CEREC milling machine. In minutes, it is ready, and your dentist can cement it in place. You are done and gone in practically no time. You also save money because you spend considerably less time in the dentist chair having your restorations fine-tuned. One-day restorations are now the standard, not the exception. CT cone beam scans are another way of imaging your mouth that allows your dentist to give you a better, more effective treatment. Usually, this technology is used to help your dentist identify the best place to insert dental implants. This technology delivers a full 3D image of your teeth and the underlying jaw structure, and is far more effective than dental x-rays. It is also safer, because there is very little radiation involved. You could think of the CT cone beam as being very much like a CT scan that you would have at your hospital. It is however, all done in your dentist’s chair, and delivers a full picture of your mouth. You do not have to wait for films to come back – your dentist will know immediately what your issues are, and what needs to be done. At Redford Dental Care, your comfort is our main concern. For that reason, we use the Odyssey Diode Soft Laser System for many treatments. This system identifies cavities easily, causing them to glow green on a computer screen. Even rudimentary cavities can be identified easily, and treated long before they have the opportunity of taking hold and affecting adjacent teeth. With soft laser treatment, you also have the benefit of having bacteria killed quickly and easily before they can build up under your gum line. It can also reduce the need for root planing and scaling, and can even be used in gingivectomy treatments. When you are treated using soft laser treatment, all you need to do is take it easy in the dentist chair. You will experience little or no discomfort, and we can have you treated and on your way quickly. This is, quite simply, the very best in modern dental technology. TruDenta is one of the best treatments for TMJ/TMD, and also for other issues that could cause pain in the head, neck, and face. Dentists use TruDenta treatments to correct grinding and clenching of the teeth, tooth breakage and dental wear, jaw discomfort, facial pain, headaches, and more. TruDenta treatments are needle-free, and work to target muscular malfunctions that can cause pain in your mouth. They can also alleviate pain from wisdom tooth extraction. In the brief space we have here, we cannot go into great detail on the way that TruDenta works or the ways in which it can benefit you, but if you contact us at Redford Dental Care, our dentists will be pleased to explain the procedure to you in detail, and discuss the ways in which it could alleviate your pain. You do not have to suffer, and TruDenta treatments are just one way in which your dentist can help you to enjoy a fulfilling, pain-free life. How many times have you heard someone say, “I would rather have a root canal than…” And then, the sentence is usually finished with something the person finds unpleasant. This is because people think root canals are painful. To be sure, dental pain is associated with root canal therapy. This is because what leads you to need root canal treatment is an infection in the tooth, and that can be very painful. Once you see your dentist for treatment, though, the pain stops. You will be given a local anesthetic before the treatment begins, and there will be no more pain. Today, root canal treatments are even easier than they were in years gone by because dentists use special microscopes to pinpoint the source of the infection. You can be in and out and have your root canal treatment done in just one appointment. It is fast, easy, and painless. Drs. Redford and Davey at Redford Dental care are always up to date with the latest developments in dental technology. Our dentist office is located at 6246 Fair Oaks Boulevard, Carmichael, CA 95608. You can arrange a consultation by phone – just call us at 916-972-8851. If you prefer, you can ask for a consultation by using the form on our Contact Us page. We are here for you, to serve all your dentistry needs. A great family operation (pun intended). I have been a patient of Dr. Davey for a long time and recently had an emergency and the staff and Dr. Davey handled it very well for me and I'm no longer in pain. Tooth infections are a bear to deal with. Thanks again Dr. Davey and staff. You guys are always awesome....from the moment I walk in the door to the moment I leave,. It doesn't matter who I'm dealing with, staff, hygienists, dentists, etc., everyone there is great and always goes above and beyond to make me feel like I am your favorite patient. Wait. I am, aren't I? You guys are stuck with me unless you up and leave town! I am a big chicken when it comes to the dentist & Dr. Redford & the staff are awesome & very understanding when I'm panicking! He does great work and it's been a long time since I've found a great dentist like him! Not only does he do great work, he is truely a great person!